While I’ve bemoaned at great length how tired I am of seeing yet another Bluetooth audio device, sometimes I’ll get ones across my desk that are simply too slick to ignore. The Carbon Audio Zooka, is exactly that. Originally coming to market as a Kickstarter project, the Zooka has since branched into outlets like The Apple Store, Nordstrom and soon Best Buy. 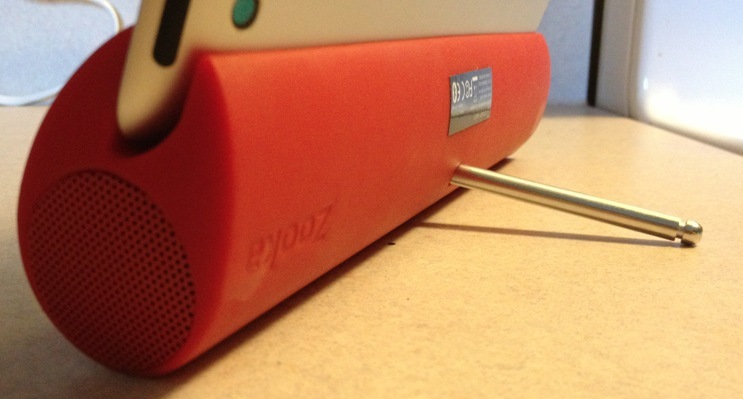 The reasoning behind the Zooka’s success is pretty simple — It looks great, it sounds good. It’s also priced right. At $99 it comes in a notable few bucks less that competitors from brands like Ozaki. So let’s dive in, shall we? First thing’s first, let’s talk design. 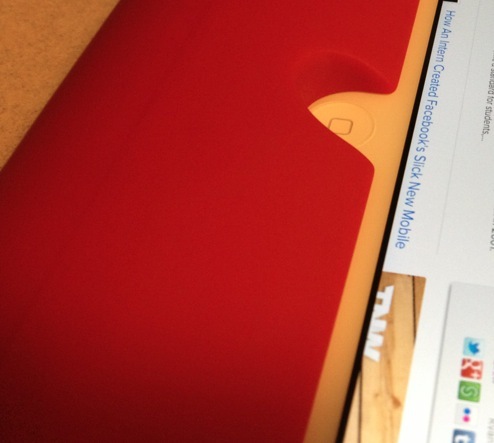 The Zooka fits almost exactly edge to edge on the long side of your iPad. As such it makes a great way to hold the device. Though promo shots show people mounting it along the edge at the top, I find the Zooka to be a bit heavy to do this comfortably for any notable period of time. There’s a detent in the front-facing side of the Zooka, allowing you to keep your camera or Home button usable. But the double-duty function is interesting. The Zooka also fits snugly along the top of your MacBook Air or Pro’s monitor and the detent leaves your camera clear there as well. Along the outside of the device are typical buttons – Power, Volume Up, Volume Down and a dedicated button for pairing the device. There’s also a micro-USB charging slot, though it’s worth mentioning that my review unit did not include a cable. The “What’s in the Box” listing on Apple’s site shows that it should have, so we’ll chalk that one up to an oversight. The speakers for the Zooka sit in the sides, with a resonating chamber between them. On one side of the Zooka you’ll also notice a metal pin. That will screw into a hole in the back of the device, allowing you to keep your iPad in a nice position for viewing. The device housing is made from a high-density material with a nice, rubberized feeling. Not only does this make it easy to hang onto, but it also feels like it will protect your rather-expensive iPad from the occasional hard landing when you’re setting it down for a movie. Now, a bit about audio quality. As I’ve noted time and time again, Bluetooth isn’t audiophile-friendly. Nothing over wireless is going to satisfy those of us with picky ears. But if you’re just looking for something that can fill a small room (such as the one in your hotel) with good quality sound, the Zooka won’t leave you disappointed. Because of the small drivers in the device, true bass response is lacking. But that’s just a matter of physics and there’s really not much of a way around the problem for portable sound bars. Mids and highs, however, are very clear. Movie vocals didn’t suffer from muddiness, and most music sounded very good. Acoustic guitar really shines, as do strings. Stereo separation was good, if not superb, but obviously better than the single-side speaker that’s native to the iPad itself. I had no problems pairing the device with my iPad, my iPhone 4S or my MacBook Pro. Also, because the Zooka is physically more svelte than any other Bluetooth speaker “dock” I’ve tried in the past, I’m more apt to actually use it on a regular basis and you will be too. You could easily stuff this into a backpack or suitcase and never notice the weight or the space that it requires. So is the Zooka the best portable Bluetooth speaker on the market? Nope. That honor still goes to the Jawbone Jambox. But with a price tag $50 lower than the Jambox, and a design that’s actually made to serve a purpose with your iPad, the Zooka is far and away my favorite Bluetooth speaker on the market today.